It is the sincere hope of this translator that this website’s presentation of classical texts in both Arabic and English can serve as a beneficial tool for those looking to improve their Arabic comprehension. Another fantastic resource of beneficial articles with side-by-side English and Arabic translations can be found here from Subulaasalaam.com. JazaakumAllaahu khairan and any feedback from our readers is appreciated. Firstly: al-Furqan, and that is knowledge and guidance by which its possessors can distinguish between guidance and and misguidance, between the truth and falsehood, between the halaal and haraam, and between the people of ultimate joy and the people of ultimate misery. Secondly and thirdly: The expiation of sins, and forgiveness of sins. Each of these is included in the other when they are mentioned independently, however when they are mentioned together, the expiation of sins is explained as referring to minor sins, while the forgiveness of sins refers to the annulment of major sins. Fourthly: The great recompense and wonderful reward for those have had taqwa of Him and prioritized His pleasure over their own desires. al-Masjid al-Aqsa is the name for the whole of the place of worship that was built by Sulayman (‘alaihis salaam), though some people have begun to give the name of ‘al-Aqsa’ – ‘the farthest’ – to the prayer-place which was built by ʿUmar Ibn Al-Khattaab (radiAllaahu ‘anhu) at the front of it. Hence when the Imaams of this Ummah entered the Masjid, they would go and pray in the prayer-place that was built by ʿUmar. And it has also been narrated from ‘Umar that he prayed in the mihrab of Dawood. With regards to the Rock, neither ʿUmar nor any of the Sahaabah prayed there, and there was no dome over it during the time of the Khulafaa’ al-Raashideen (Rightly-Guided Caliphs). It was open to the sky during the times of ʿUmar, ʿUthmaan, ʿAli, Muʿaawiyah, Yazeed and Marwaan. But when his son ‘Abd al-Malik was the ruler over Syria and the fitnah took place between him and ibn al-Zubair, the people would make Hajj and join ibn al-Zubair [who controlled the city of Mecca at that time], so ‘Abd al-Malik wanted to divert the people away from ibn al-Zubair, so he built a dome on top of the Rock and covered it in the winter and in the summer in order to encourage people to visit Jerusalem, and so he kept them occupied from joining ibn al-Zubair. And as for the scholars among the Sahaabah and those who followed them faithfully, they did not venerate the Rock because it was an abrogated Qiblah, just as is the case with Saturday. Saturday was an ‘eid in the sharee’ah of Moosaa (‘alaihis salaam), then it was abrogated in the sharee’ah of Muhammad (salaAllahu ‘alaihi was-salaam) with Friday. And it is not appropriate for the Muslims to single out Saturday or Sunday for worship as the Jews and Christians do. Similarly with the Rock; it was only venerated by the Jews and some of the Christians. * Ka’b al-Ahbar was one of the Jewish Rabbis who had become a Muslim. ‘Umar rebuked him because his suggestion to build the prayer-place behind (i.e. on the north side of )the Rock would mean that when they congregation would prayer, they would have to pray directly towards the abrogated qibla of the Rock in order to also face the ordained qibla of the Ka’aba. ‘Umar wanted there to be no confusion, so he built the prayer-place to the south of the Rock. 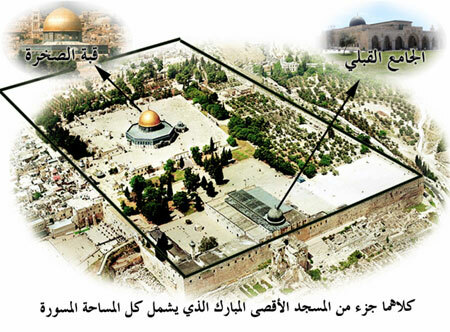 -And according to ibn Taymiyyah’s description, Masjid al-Aqsa is all of what is contained within the black box, including Dome of the Rock and the prayer-place built by ‘Umar. This was previously the site of the temple built by the Prophet Sulayman, which was later demolished (see Qur’an 17:7), then rebuilt during the time of ‘Uzayr, then demolished again a few decades after Allah raised ‘Eesaa up to Himself. It has never been rebuilt however the site remains an honored place and the place to which Allah brought His Prophet on the night of al-Israa’ w’al-Mi’raaj, even though there was neither the Dome of the Rock nor the prayer-place of ‘Umar at that time. I said, “O Messenger of Allah! The people return (from Mecca) having done two acts of worship (both Hajj and‘Umrah), but I am coming back with only one. قوله صلى الله عليه وسلم : ( ولكنها على قدر نصبك أو قال : نفقتك ) هذا ظاهر في أن الثواب والفضل في العبادة يكثر بكثرة النصب والنفقة ، والمراد النصب الذي لا يذمه الشرع ، وكذا النفقة . His (ﷺ) statement “‘And it is according to your hardship’, or he said, ‘your spending’” – It is apparent that the reward and excellence of the (act of) worship increases with an increase in hardship and spending, and the intended meaning of hardship is that which is not dispraised by the sharee’ah, and similarly with spending. Meaning: He is the exclusive and sole provider of this blessing when “[He] extracted you from the wombs of your mothers not knowing a thing” and not being able to do anything, then He “made for you hearing and vision and intellect“. And He singled out these there faculties, in order to honor them and favor them because they are the keys to all knowledge, so the slave does not attain knowledge except through one of these three doors, and except through the remaining the limbs and capacity – both openly and secretly: He [alone] is the one who gives that to them. And He made them grow little by little until they reached their proper state, and that is in order for them to be grateful to Allah, by using what he has given them of these faculties in the obedience of Allah. For whoever uses them for other than that, it is a hujjah (proof) against him and he is one who accepts a blessing with the ugliest of acceptances. In the Saheehayn (al-Bukhari and Muslim) from Abu Hurayrah (radiAllaahu ‘anhu) that the Prophet (ﷺ) said, “Whoever performs Hajj to this House, and does not have sexual relations nor commit any disobedience, will return like the day his mother bore him“. The pillars of Islam are five; each one of them expiates the sins and bad deeds and and abolishes them. And La ilaaha illallaah (There is no deity worthy of worship except Allah) does not leave any sins remains nor the actions which preceded it. And the five (daily) prayers, and from one jumu’ah to the next, and from one Ramadan to the next are expiators of what occurs between them for the one who avoids the major sins. And charity extinguishes bad deeds just as water extinguishes fire. And the Hajj in which one does not have sexual relations nor commit disobedience, then its doer will return free of sin like the day on which his mother bore him. The Messenger of Allah (ﷺ) arrived in al-Madinah and found the Jews observing fast on the day of ‘Aashooraa’. The Messenger of Allah (ﷺ) said to them, “What is this day that you observe fast on it?” They said, “It is a great day when Allah delivered Moosaa and his people, and drowned the Firawn and his people, and Moosaa observed fast out of gratitude so we fast it.” Upon this the Messenger of Allah said, “We have more right, and we have a closer connection with Moosaa than you have; so Allah’s Messenger observed fast, and gave orders that it should be observed. قوله : ( أن النبي صلى الله عليه وسلم قدم المدينة فوجد اليهود يصومون عاشوراء ، وقالوا : إن موسى صامه وإنه اليوم الذي نجوا فيه من فرعون وغرق فرعون ، فصامه النبي صلى الله عليه وسلم ، وأمر بصيامه ، وقال : نحن أحق بموسى منهم ) . Al-Maaziri said: The information of the Jews is not accepted, so it is likely that the Prophet (ﷺ) received revelation of the veracity of what they said, or it was reported with such a high degree of mutually affirming transmission such that he knew of it. Al-Qaadhi ‘Iyaadh said a refutation of al-Maaziri: Muslim has narrated that the Quraish used to fast it [i.e. the day of ‘Aashooraa’], so when the Prophet (ﷺ) arrived in al-Madinah he fasted it. So it was not introduced to him by the speech of the Jews as a legislative ruling requiring a comment about it; it was only a description of the situation, and a response to the question. So his statement, “He fasted it” – this is not an initiation of his fasting at that time due to their statement, and even if it did carry that meaning [i.e. that the Prophet instituted the fasting based on a single report], then it is likely that he was informed of it by one of those who became a Muslim from among their scholars, such as Ibn al-Salaam of other than him. Al-Qaadhi said: And some of them have said, “It is likely that he (ﷺ) used to fast [the day of ‘Aashooraa’] in Mecca, then he abandoned his fasting [on that day] until he learned that the Ahl al-Kitaab would fast it. And al-Qaadhi said: And what we have mentioned of it is according to the wording of the hadeeth. I [Imam al-Nawawi] say: The statement of al-Maaziri is selected, and the summary of that is that he (ﷺ) used to fast it [‘Aashooraa’] just as the Quraish fasted it in Mecca, then when he arrived in al-Madinah he found the Jews fasting it, so he fasted it also according to revelation or mutawaatir reports or out of independent judgement, but not merely according to a single report. And Allah knows best. Indeed the first deed by which a servant will be called to account on the Day of Resurrection is his Salaat. If it is complete, then he is successful and saved, but if it is defective, then he has failed and lost. So if something is deficient in his obligatory prayers then the Lord, Mighty and Sublime says: ‘Look! Are there any voluntary prayers for my worshipper?’ So with them, what was deficient in his obligatory prayers will be completed. Then the rest of his deeds will be treated like that. His statement, “indeed the first deed by which a servant will be called to account on the Day of Resurrection is his Salaat” – meaning the obligatory ones. Al-Iraaqi said in his explanation of al-Tirmidhi, “There is no contradiction between this hadith and the aunthentic hadith “The first matter concerning which scores will be settled among the people on the Day of Resurrection will be bloodshed.” For this hadith is concerning the rights of Allah, and the other authentic hadith is concerning the rights between human beings. And if it is said, “So which of these two comes first, the accounting of the slaves for the rights of Allah, or their accounting for their mutual rights?” Then the answer is that this is a matter of revelation, and the clear hadiths show that that which occurs first is the reckoning for the rights due to Allah, the Exalted. And it is said first comes the abandoning of ‘ibaadaat and second comes the performing of sins. ” وإن فسدت ” بأن لم تؤد أو أديت غير صحيحة أو غير مقبولة ” فقد خاب ” بحرمان المثوبة ” وخسر ” بوقوع العقوبة ، وقيل معنى خاب ندم وخسر أي صار محروما من الفوز والخلاص قبل العذاب . “But if it is defective” because he did not perform them or he did not perform them correctly or they are otherwise unacceptable “then he has failed” being deprived of the reward “and lost” by incurring punishment. And it is said that the meaning of ‘failed’ is regret and loss – meaning the he became deprived of success and sincerity before punishment. “So if there is a deficiency” meaning something is lacking “of something” – meaning from the obligatory salaat. “Look! Are there any voluntary prayers for my worshipper?” – meaning in the record of his sunnah or naafilah (optional) prayers according to what is apparent from the context either before the obligatory prayer, or after it, or in general. ” فيكمل ” بالتشديد ويخفف على بناء الفاعل أو المفعول وهو الأظهر وبالنصب ويرفع قاله القاري ” بها ” قال ابن الملك : أي بالتطوع وتأنيث الضمير باعتبار النافلة . وقال الطيبي : الظاهر نصب فيكمل على أنه من كلام الله تعالى جوابا للاستفهام ، ويؤيده رواية أحمد فكملوا بها فريضته ، وإنما أنث ضمير التطوع في بها نظرا إلى الصلاة . Perhaps what is meant by that is what is deficient in terms of the sunan and legislated matters of it, such as al-khushoo’ and dhikr and supplications, and that he still gets rewarded for the obligatory prayers even if he doesn’t do these things therein, and only does them during the optional prayers. And perhaps what is intended by that is also deficiencies in the core part and pillars of the prayer, and perhaps what it is intended is the abandonment of the principle obligations, so he does not pray them, in which case he would not be compensated for that deficiency by his optional prayers. And Allah, High and Exalted is He, accepts from the correct optional prayers as compensation for the obligatory prayers. وقال ابن العربي : يحتمل أن يكون يكمل له ما نقص من فرض الصلاة وأعدادها بفضل التطوع ، ويحتمل ما نقصه من الخشوع والأول عندي أظهر لقوله ، ثم الزكاة كذلك وسائر الأعمال ، وليس في الزكاة إلا فرض أو فضل فكما يكمل فرض الزكاة بفضلها كذلك الصلاة وفضل الله أوسع ووعده أنفذ وعزمه أعم ، انتهى . Perhaps what is meant is to complete what is lacking from the obligatory prayers and their numbers by virtue of the optional prayers, and perhaps what is meant is the lack of al-khushoo’ and to me that is what is most clear from his statement [in another narration ] “then the zakaat and so on for the remaining deeds,” for there is nothing of zakaat except for what is obligatory or what is extra, so just as the obligatory zakaat is perfected by giving extra, so it is with the salaah. And Allah gives the most expansive blessing and His promise is the most able to be fulfilled and His decision is the most encompassing. “Then the rest of his deeds will be treated like that” – meaning if there are deficiencies in the obligations from the remaining deeds, they will be completed by the optional deeds. This is information about human nature, what are his origins, and his lack of patience and endurance, both in the face of good and evil, except for he for whom Allah has changed his condition to the perfect condition, and He says, “Man is not weary of supplication for good” – meaning, he never tires of supplicating to Allah for riches and wealth and offspring and other such objects of desire in this worldly life. And he does not desist in toiling for that, and he is not satisfied with a little or even with a lot of the worldly riches. And whether he were to achieve those things or not, he would not cease to seek more. “But if evil touches him” – meaning those disliked things such as illness, poverty, and all sorts of trials – “then he is hopeless and despairing” – meaning he despairs of the mercy of Allah the Exalted, and thinks that this trial has been brought upon him for his destruction, and is confused about its causes, and that it is other than what he loves and requests. Except for those who believe and do righteous good deeds, for certainly they, when they are struck with good, blessings and that which they love, they are grateful to Allah the Exalted. And they fear that the blessing of Allah upon them may be a test of endurance or a respite [i.e. a delay of punishment from this life to the next]. And if they are afflicted corporeally or financially or in terms of their offspring, they are steadfastly patient, and they hope for the good from their Lord, and they never despair or give up hope. Then He said, “And if We let him taste” – meaning, mankind which never tires of supplicating for good, and if he is touched by evil them he is hopeless and despairing – “mercy from Us” – meaning, after that evil which afflicted him, because Allah cured him from his sickness of enriched him from his state of poverty, then certainly he will not be grateful to Allah the Exalted; rather he will transgress and overstep the bounds, and he says, “This is [due] to me” – meaning, this is for me because I deserve it and I have a right to it – “and I do not think the Hour will occur” and this is him denying the resurrection, and disbelieving in the blessing and mercy which Allah has allowed him to taste. “And [even] if I should be returned to my Lord, indeed, for me there will be with Him the best” – meaning, when the Hour is established, and I will certainly return to my Lord, if He has something for me, then it will be good such as what blessing I had in the worldly life, so this will also be mine in the next life. And this is the greatest crime to say [something] about Allah without ‘ilm. And there is his promise in His statement, “But We will surely inform those who disbelieved about what they did, and We will surely make them taste a massive punishment“. “And when We bestow favor upon man” with health or provisions or other than that, “he turns away” from his Lord and from gratitude to Him “and withdraws” – elevates himself – “aside“ – amazed and prideful. “But when evil touches him” – meaning, sickness or poverty or other than that – “then he is full of extensive supplication” – meaning, very abundant, the absence of his sabr, for there is no sabr in adversity, nor gratitude in prosperity, except for the one whom Allah guided and bestowed a blessing upon him. And as for taking it [i.e.yawm al-‘aashooraa’] as a time of mourning as the raafidhah (Shi’a) have made it on account of the murder of al-Hussain ibn ‘Ali (radiAllaahu ‘anhuma) on this day, then this is from the actions of those whose efforts have gone astray in the life of this dunya and who consider it as a beautified invention. And neither Allah nor His messenger ordered the taking of the calamitous days of the anbiyaa’ or their deaths as times of mourning, so then what about someone less than them?